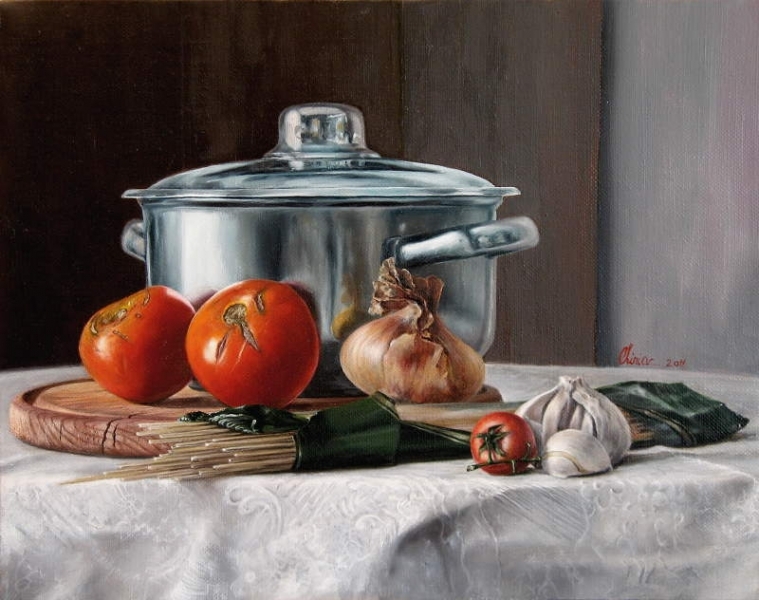 Fine art oil painting, still life of stainless steel pot, tomatoes, spaghetti, onion and garlic. Title: “Italian dinner”, Oil on canvas, 30×40 cm, sold. In the year 2007 I discovered the artrenewal.org website. The fabulous realistic art that I discovered there turned me off of almost any form of abstraction. I worked mostly abstract until 2006 and surrealist after that year but nothing in the realistic style. Well, when I discovered that website and especially the works selected for their art contest, I started dreaming to submit my own artwork to that contest. So that I begun to paint realistic composition. “Italian dinner” is the painting which was meant to be submitted to the Art Renewal annual contest. I started to paint it with this though in mind. Setting, elements, mood, all of them was chosen to result an original artwork still life composition, good enough to be selected the short list finalists. The quality of the Art Renewal art contest selected paintings is so high than only the fact of being selected the the short list would be a great self achievement. I wanted to paint a classical realistic still life composition but with subtle contemporary elements. This is why I used a stainless steel pot and plastic bag of spaghetti. An interesting detail of the painting’s story is that I painted it while made my vacation in a monastery – Agapia monastery, a gorgeous place to spend some time in serenity. It’s a special monastery of nuns where they have their own houses so they are able to rent rooms for outsiders but only if the tourist has a recommendation from a previous one or from another nun who knows him. Agapia was a wonderful place to paint this painting which I hope it will last many years in the home of the art collector who bought it. ← Silver Award for my online art gallery! !